Many accountants are recognizing the need to convert existing compliance clients to a 15-30k advisory assignment. By introducing or expanding this profitable revenue arm, accounting practices are also meeting the growing demand from clients demanding ‘more’. Clients are looking for comprehensive advice about how to grow their business and improve systems. The ever-growing popularity of cloud based solutions among small to medium businesses presents an interesting opportunity for accountants. Research suggests that 43% of small to medium business employees work at more than one location. This has driven a spike in businesses looking to cloud based solutions, which is now up to 70%. Now is the right time to offer cloud based solutions to your clients. Not only as a platform for establishing monthly advisory services with your client, but as a system they can implement throughout the business to increase profits, accountability and performance of staff, and strategy execution. One solution now available to accountants is the MAUS Hub. This award winning tool allows you to offer over 8 integrated cloud solutions on the one platform, at an affordable price. It offers you and your clients an online platform to establish ongoing monthly or quarterly meetings. Modules offered in this single integrated cloud platform include business planning, KPI monitoring, systems, policies and procedures, exit and succession planning, health & safety compliance and more. A product such as the MAUS Hub is an opportunity that must be explored by any accountant looking to add or expand a business advisory arm. Not only does it attract profitable clients who are looking at cloud based SaaS products, it gives your practice the technological ammunition required to stand out from the crowd, and engage clients on a profitable ongoing basis. 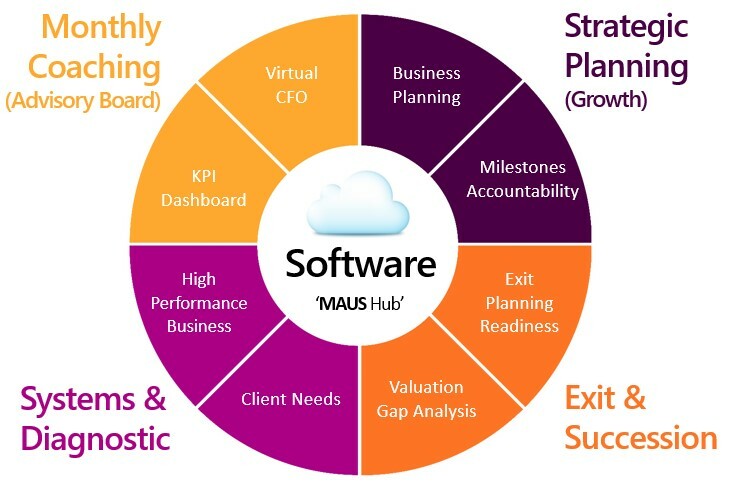 The core modules available in the MAUS hub are shown in the below diagram.